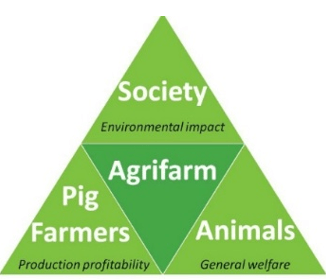 HYBRIDFARM is a Market Maturation project for AGRIFARMs resource efficient, animal friendly and eco-innovative slaughter pig production farm. The HYBRIDFARM project is financially supported by EASME – EUROPEAN COMMISSION. The project has a duration for 24 months during which period 2 IntelliFarm barns must be constructed, documented and showcased. Knowledge about the benefits of the Intellifarm for end users and the surrounding society will be spread, giving AgriFarm a quantum jump into the future international marketing of the IntelliFarm. The Executive Agency for Small and Medium- sized Enterprises (EASME) under the power delegated by EUROPEAN COMMISSION (Horizon2020) helps small- and medium-sized enterprises (SMEs) bringing their new products to the market faster. The aim is to promote growth, employment and export, particularly for SMEs, because this group of enterprises will create the major part of future innovations.